Toyota Alvar Apr.21 Hokkaido L.
36-year old center David Simon (208-C-82) had a great game in the last round for second-ranked Kyoto Hannar. 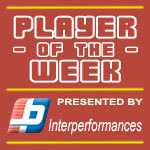 and receives a Interperformances Player of the Week award for round 39. He had the game-high 36 points adding eight rebounds and four assists for Kyoto Hannar. in his team's victory, helping them to beat Nagoya DD (#3, 21-18) 89-82. Kyoto Hannar. is placed at 2nd position in their group in Japanese league. They would have been even better if they hadn't lost a few games earlier this season. Kyoto Hannar. will need more victories to improve their 22-17 record. In the team's last game Simon had a remarkable 72.7% from 2-point range. He turned to be Kyoto Hannar. 's top player in his first season with the team. Purdue University Fort Wayne graduate has very impressive stats this year. Simon is in league's top in points (2nd best: 24.1ppg) and averages solid 2.2bpg and 59.4% FGP. 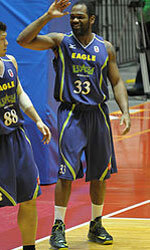 Second best performed player last round was Marqus Blakely (201-F-88) of Shiga L-Stars. He is American forward in his first season at Shiga L-Stars. In the last game Blakely recorded impressive double-double of 28 points and 13 rebounds. Bad luck as Shiga L-Stars lost that game 70-83 to the higher-ranked Toyota Alvark (#3, 27-12). Shiga L-Stars managed to keep the same 6th spot in West. 31 lost games are too many comparing to just eight victories Shiga L-Stars managed to get this year. Blakely is a newcomer at Shiga L-Stars and quickly became one of team's most reliable players. Third place about best performers goes to forward Nick Fazekas (211-F/C-85) of league's second-best Kawasaki BT. Fazekas got into 30-points club by scoring 31 points in the last round. He went also for eleven rebounds and four assists. He was a key player of Kawasaki BT, leading his team to a 83-81 win against the lower-ranked San-en (#5, 17-22). Kawasaki BT needs these victories very badly if they think about taking over top position in Central. Their record at this point is 23 victories and 16 lost games. Fazekas has a great season in Japan. After 36 games, he made it on the list of the league's leaders in points with 22.1ppg (6th best) and rebounds with 11.0rpg (8th best). Nick Fazekas has also Japanese passport and can play in the league with a status of domestic player. There will be only one (last) round of the Regular Season in B League. Here is the last round review presented by ESL. Sixth-ranked Yokohama BC (14-45) gave a tough game to first ranked Niigata Albirex (44-15) on Saturday. Niigata Albirex managed to secure only one-point victory 89-88. However their fans expected much easier game. Strangely Yokohama BC outrebounded Niigata Albirex 46-29 including a 33-22 advantage in defensive rebounds. It was a great evening for American Davante Gardner (203-91, college: Marquette) who led his team to a victory with a double-double by scoring 34 points (!!! ), 10 rebounds and 4 assists. His fellow American import power forward Lamont Hamilton (208-84, college: St.John's) helped adding 10 points and 5 rebounds. American power forward Alex Stepheson (208-87, college: USC) responded with a double-double by scoring 24 points and 21 rebounds (on 10-of-13 shooting from the field). Both coaches used bench players in such tough game. Niigata Albirex have an impressive series of nine victories in a row. They maintain first place with 44-15 record. Yokohama BC lost twelfth consecutive game. They keep the sixth position with 45 games lost. Niigata Albirex are again looking forward to face Yokohama BC (#6) at home in the next round which should be theoretically an easy game. Yokohama BC will have a break next round. Third-ranked Aishin Sea Horses (31-29) gave a tough game to second ranked Toshiba Thunders (40-21) in Kariya. The visitors from Kanagawa managed to secure only one-point victory 75-74. However their fans expected easier game. It ended at the same time the three-game winning streak of Aishin Sea Horses. It was an exceptional evening for American power forward Vernon Macklin (208-86, college: Florida) who led the winners and scored 18 points and 8 rebounds. Nick Fazekas accounted for 17 points, 6 rebounds and 5 assists. American center Isaac Butts (208-89, college: Appalachian St.) came up with a double-double by scoring 13 points and 14 rebounds (perfect from the field making all six shots) for Aishin Sea Horses in the defeat. Both coaches tested many bench players in such tough game. Toshiba Thunders maintains second place with 40-21 record having nine points less than leader Ryukyu GK. Aishin Sea Horses at the other side dropped to the fourth position with 29 games lost. Toshiba Thunders will have a break next round, and it should allow them to practice more before next game. Aishin Sea Horses will play again at home against the league's second-placed Toshiba Thunders (#2) and it may be a tough game between close rivals. The game between Top Four teams took place in Osaka. 4th placed host Osaka Evessa (22-37) lost to third ranked Kyoto Hannar. (31-28) 69-57. The best player for the winners was Julian Mavunga who had a double-double by scoring 29 points, 13 rebounds and 4 assists. Trevor Mbakwe produced 8 points and 16 rebounds for the hosts. Osaka Evessa's coach Kensuke Hosaka rotated eleven players in this game, but that didn't help. Kyoto Hannar. maintains third place with 31-28 record having twenty points less than leader Ryukyu GK. Loser Osaka Evessa keeps the fourth position with 37 games lost. They share it with San-en. Kyoto Hannar. will have a break next round, and it should allow them to practice more before next game. Osaka Evessa will play again against Kyoto Hannar. (#3) and it may be a tough game between close rivals. The game between Top Four teams took place in Kariya. 3rd placed host Aishin Sea Horses (31-29) lost to second ranked Toshiba Thunders (40-21) 83-66. It ended at the same time the three-game winning streak of Aishin Sea Horses. Nick Fazekas orchestrated the victory by scoring 23 points and 9 rebounds. Both coaches allowed to play bench players saving starting five for next games. Toshiba Thunders maintains second place with 40-21 record having nine points less than leader Ryukyu GK. Aishin Sea Horses at the other side dropped to the fourth position with 29 games lost. Toshiba Thunders will have a break next round. Aishin Sea Horses will play again at home against the league's second-placed Toshiba Thunders (#2) and it may be a tough game between close rivals. The game between Top Four teams took place in Tokyo. 4th placed host Hitachi Sunrockers (27-32) were smashed by first ranked Chiba Jets (51-8) 94-69. It was a great evening for Tre McKinney-Jones who led his team to a victory scoring 23 points and 6 rebounds. The winner was already known earlier in the game, so both coaches allowed to play the bench players saving starting five for next games. The victory was the seventh consecutive win for Chiba Jets. They maintain first place with 51-8 record. Hitachi Sunrockers lost their fourth game in a row. They keep the fourth position with 32 games lost. Chiba Jets will have a break next round. Hitachi Sunrockers will play again at home against the league's leader Chiba Jets (#1) and hope to win that game. There were no shocking results in the rest of the games of round 59: Shiga L-Stars lost to Ryukyu GK on the opponent's court 63-69. Fukuoka Rizing unfortunately lost to Nagoya DD in a home game 73-77. Akita NH recorded a loss to Tochigi Brex on the road 73-78. Tochigi Brex defeated Akita NH on its own court 80-72. San-en was beaten by Toyama Grouses in a road game 89-72. Toyota Alvark won against Hokkaido L. at home 96-84. The game between Top Four teams took place in Osaka. 4th placed host Osaka Evessa (22-37) lost to third ranked Kyoto Hannar. (31-28) 69-57. They made 18-of-21 free shots (85.7 percent) during the game. Strangely Osaka Evessa outrebounded Kyoto Hannar. 51-35 including a 21-4 advantage in offensive rebounds. The best player for the winners was Zimbabwean-American Julian Mavunga (203-90, college: Miami, OH, agency: Pensack Sports) who had a double-double by scoring 29 points, 13 rebounds and 4 assists. American center Shaquille Morris (203-94, college: Wichita St.) chipped in 12 points and 8 rebounds. American-Nigerian power forward Trevor Mbakwe (207-89, college: Minnesota, agency: Pensack Sports) produced 8 points and 16 rebounds and American forward Josh Harrellson (208-89, college: Kentucky) added 7 points, 11 rebounds and 4 assists respectively for the hosts. Osaka Evessa's coach Kensuke Hosaka rotated eleven players in this game, but that didn't help. Kyoto Hannar. maintains third place with 31-28 record having twenty points less than leader Ryukyu GK. Loser Osaka Evessa keeps the fourth position with 37 games lost. They share it with San-en. Kyoto Hannar. will have a break next round, and it should allow them to practice more before next game. Osaka Evessa will play again against Kyoto Hannar. (#3) and it may be a tough game between close rivals. The game between Top Four teams took place in Kariya. 3rd placed host Aishin Sea Horses (31-29) lost to second ranked Toshiba Thunders (40-21) 83-66. It ended at the same time the three-game winning streak of Aishin Sea Horses. Toshiba Thunders players were unselfish on offense dishing 24 assists. International power forward Nick Fazekas (211-85, college: Nevada) orchestrated the victory by scoring 23 points and 9 rebounds. American power forward Vernon Macklin (208-86, college: Florida) contributed with 14 points, 9 rebounds and 4 assists for the winners. American center Isaac Butts (208-89, college: Appalachian St.) answered with a double-double by scoring 13 points and 17 rebounds and the former international center JR Sakuragi (206-76, college: UCLA) added 17 points, 10 rebounds and 5 assists in the effort for Aishin Sea Horses. Both coaches allowed to play bench players saving starting five for next games. Toshiba Thunders maintains second place with 40-21 record having nine points less than leader Ryukyu GK. Aishin Sea Horses at the other side dropped to the fourth position with 29 games lost. Toshiba Thunders will have a break next round. Aishin Sea Horses will play again at home against the league's second-placed Toshiba Thunders (#2) and it may be a tough game between close rivals. Very expected game in Okinawa where 5th ranked Shiga L-Stars (18-41) were defeated by first ranked Ryukyu GK (39-20) 69-63 on Saturday. However just six-point win is not that big difference and the fans of host team counted on more convincing victory. Americans were the main players on the court. It was a great evening for forward Jeff Ayres (206-87, college: ASU) who led his team to a victory scoring 15 points and 9 rebounds. Forward Kevin Jones (206-89, college: WVU) helped adding 14 points and 9 rebounds. Power forward Allen Durham (198-88, college: Grace Bible) responded with a double-double by scoring 19 points and 20 rebounds and swingman Henry Walker (198-87, college: Kansas St.) scored 23 points and 8 rebounds. Shiga L-Stars' coach Shawn Dennis let to play ten players, but that didn't help to avoid defeat in this game. Ryukyu GK maintains first place with 39-20 record. Loser Shiga L-Stars keep the fifth position with 41 games lost. Ryukyu GK will face again Shiga L-Stars (#5) at home in the next round. The game between Top Four teams took place in Tokyo. 4th placed host Hitachi Sunrockers (27-32) were smashed by first ranked Chiba Jets (51-8) 94-69. Chiba Jets shot the lights out from three sinking 13 long-distance shots on high 52.0 percentage. It was a great evening for American guard Tre McKinney-Jones (198-90, college: Miami, FL) who led his team to a victory scoring 23 points and 6 rebounds. His fellow American import power forward Gavin Edwards (206-88, college: Connecticut) helped adding 19 points and 8 rebounds. Canadian center Robert Sacre (213-89, college: Gonzaga) responded with a double-double by scoring 15 points and 13 rebounds and international forward Yusei Sugiura (196-95) scored 20 points. Both teams had four players each who scored in double figures. The winner was already known earlier in the game, so both coaches allowed to play the bench players saving starting five for next games. The victory was the seventh consecutive win for Chiba Jets. They maintain first place with 51-8 record. Hitachi Sunrockers lost their fourth game in a row. They keep the fourth position with 32 games lost. Chiba Jets will have a break next round. Hitachi Sunrockers will play again at home against the league's leader Chiba Jets (#1) and hope to win that game. Rather predictable result when second ranked Diamond Dolphins (32-27) defeated on the road 6th ranked Fukuoka Rizing (12-47) 77-73 on Saturday. It was a great evening for American forward Justin Burrell (207-88, college: St.John's) who led his team to a victory with a double-double by scoring 23 points and 19 rebounds. His fellow American import Craig Brackins (208-87, college: Iowa St.) helped adding 11 points, 7 rebounds and 5 assists. British forward Benjamin Lawson (216-95, college: WKU) responded with a double-double by scoring 19 points and 17 rebounds and American Eric Jacobsen (208-94, college: ASU) produced a double-double by scoring 16 points, 10 rebounds and 6 assists. Four Fukuoka Rizing players scored in double figures. Fukuoka Rizing's coach Ryuji Kawai let to play ten players, but that didn't help to avoid defeat in this game. Diamond Dolphins maintains second place with 32-27 record having nineteen points less than leader Ryukyu GK. Newly promoted Fukuoka Rizing keeps the sixth position with 47 games lost. Diamond Dolphins will have a break next round. Fukuoka Rizing will play again at home against the league's second-placed Diamond Dolphins (#2) and hope to win that game. Third-ranked Aishin Sea Horses (31-29) gave a tough game to second ranked Toshiba Thunders (40-21) in Kariya. The visitors from Kanagawa managed to secure only one-point victory 75-74. However their fans expected easier game. It ended at the same time the three-game winning streak of Aishin Sea Horses. Toshiba Thunders players were unselfish on offense dishing 24 assists. It was an exceptional evening for American power forward Vernon Macklin (208-86, college: Florida) who led the winners and scored 18 points and 8 rebounds. International power forward Nick Fazekas (211-85, college: Nevada) accounted for 17 points, 6 rebounds and 5 assists for the winning side. Four Toshiba Thunders players scored in double figures. American center Isaac Butts (208-89, college: Appalachian St.) came up with a double-double by scoring 13 points and 14 rebounds (perfect from the field making all six shots) and the former international swingman Kosuke Kanamaru (193-89) added 23 points respectively for Aishin Sea Horses in the defeat. Both coaches tested many bench players in such tough game. Toshiba Thunders maintains second place with 40-21 record having nine points less than leader Ryukyu GK. Aishin Sea Horses at the other side dropped to the fourth position with 29 games lost. Toshiba Thunders will have a break next round, and it should allow them to practice more before next game. Aishin Sea Horses will play again at home against the league's second-placed Toshiba Thunders (#2) and it may be a tough game between close rivals. Not a big story in a game when 5th ranked Akita Happinets (17-43) were defeated on the road by second ranked Tochigi Brex (49-10) 78-73 on Saturday. Tochigi Brex made 19-of-24 free shots (79.2 percent) during the game. It was a great evening for American forward Jeffrey Gibbs (188-80, college: Otterbein) who led his team to a victory scoring 18 points and 6 rebounds. His fellow American import forward Ryan Rossiter (204-89, college: Siena) helped adding 15 points, 6 rebounds and 4 assists. American power forward Justin Keenan (202-88, college: Ferris St.) responded with a double-double by scoring 38 points (!!!) and 11 rebounds (was perfect 15-for-15 from the free throw line !!!) and point guard Takuya Nakayama (182-94) scored 6 points and 5 assists. Both coaches allowed to play bench players in such tough game. The victory was the eighth consecutive win for Tochigi Brex. They maintain second place with 49-10 record having just two points less than leader Ryukyu GK. Newly promoted Akita Happinets keep the fifth position with 43 games lost. Tochigi Brex will face again Akita Happinets (#5) at home in the next round. Everything went according to plan when second ranked Tochigi Brex (49-10) beat at home 5th ranked Akita Happinets (17-43) 80-72 on Friday. Tochigi Brex looked well-organized offensively handing out 22 assists. It was a great evening for American forward Ryan Rossiter (204-89, college: Siena) who led his team to a victory scoring 24 points, 8 rebounds and 8 assists. Guard Seiji Ikaruga (185-94) helped adding 19 points. American power forward Justin Keenan (202-88, college: Ferris St.) responded with 15 points and 8 rebounds and point guard Takuya Nakayama (182-94) scored 9 points and 7 rebounds. Both teams had four players each who scored in double figures. Both coaches allowed to play bench players saving starting five for next games. The victory was the eighth consecutive win for Tochigi Brex. They maintain second place with 49-10 record having just two points less than leader Ryukyu GK. Newly promoted Akita Happinets keep the fifth position with 43 games lost. Tochigi Brex will face again Akita Happinets (#5) at home in the next round. The game between closely ranked teams ended with 5th ranked San-en NeoPhoenix's (22-37) road loss to fourth ranked Toyama Grouses (32-28) 72-89 on Saturday. Toyama Grouses dominated down low during the game scoring 66 of its points in the paint compared to San-en NeoPhoenix's 44. They outrebounded San-en NeoPhoenix 44-23 including a 31-19 advantage in defensive rebounds. Toyama Grouses looked well-organized offensively handing out 22 assists. It was a great evening for American forward Leo Lyons (206-87, college: Missouri) who led his team to a victory with a double-double by scoring 25 points and 13 rebounds. His fellow American import center Joshua Smith (208-92, college: Georgetown) helped adding 20 points and 13 rebounds. Four Toyama Grouses players scored in double figures. Point guard Tatsuya Suzuki (169-91) responded with 10 points and 7 assists and American-Bulgarian power forward Cedric Simmons (206-86, college: NC State) scored 14 points (on 7-of-9 shooting from the field). Both coaches allowed to play bench players saving starting five for next games. Toyama Grouses moved-up to third place. San-en NeoPhoenix lost their fourth game in a row. They dropped to the fourth position with 37 games lost. Toyama Grouses will face again San-en NeoPhoenix (#5) in Hamamatsu in the next round. Sixth-ranked Yokohama BC (14-45) gave a tough game to first ranked Niigata Albirex (44-15) on Saturday. Niigata Albirex managed to secure only one-point victory 89-88. However their fans expected much easier game. Strangely Yokohama BC outrebounded Niigata Albirex 46-29 including a 33-22 advantage in defensive rebounds. It was a great evening for American Davante Gardner (203-91, college: Marquette) who led his team to a victory with a double-double by scoring 34 points (!!! ), 10 rebounds and 4 assists. His fellow American import power forward Lamont Hamilton (208-84, college: St.John's) helped adding 10 points and 5 rebounds. American power forward Alex Stepheson (208-87, college: USC) responded with a double-double by scoring 24 points and 21 rebounds (on 10-of-13 shooting from the field) and the former international point guard Ryo Tawatari (180-93, college: Dominican, CA) scored 17 points and 7 assists. Both teams had four players each who scored in double figures. Both coaches used bench players in such tough game. Niigata Albirex have an impressive series of nine victories in a row. They maintain first place with 44-15 record. Yokohama BC lost twelfth consecutive game. They keep the sixth position with 45 games lost. Niigata Albirex are again looking forward to face Yokohama BC (#6) at home in the next round which should be theoretically an easy game. Yokohama BC will have a break next round. No shocking result in a game in Tokyo where third ranked Toyota Alvark (42-16) won against 6th ranked Hokkaido L. (10-49) 96-84 on Saturday. It was a great shooting night for Toyota Alvark especially from behind the arc, where they had solid 57.9 percentage. They looked well-organized offensively handing out 26 assists. It was a great evening for American center Alex Kirk (211-91, college: N.Mexico, agency: Pensack Sports) who led his team to a victory scoring 16 points and 4 assists (on 8-of-10 shooting from the field). The former international swingman Shohei Kikuchi (191-84) helped adding 14 points and 6 rebounds. Five Toyota Alvark players scored in double figures. British-American center Byron Mullens (213-89, college: Ohio St.) responded with a double-double by scoring 39 points (!!!) and 14 rebounds and Canadian-Italian power forward Marc Trasolini (206-90, college: Santa Clara) scored 21 points. Hokkaido L.'s coach Tomohide Utsumi let to play twelve players, but that didn't help to avoid defeat in this game. Defending champion maintains third place with 42-16 record having ten points less than leader Ryukyu GK. Hokkaido L. lost their twenty first game in a row. They keep the sixth position with 49 games lost. Toyota Alvark will face again Hokkaido L. (#6) in Saporro in the next round. There will be only one (last) round of the Regular Season in B2 League. There was no lack of interesting games this round. The round ended with favorites losing the games and games ending by tiny margin. Here is the last round review presented by ESL. Fifth-ranked Kanazawa Sam. (21-39) gave a tough game to third ranked Nishinomiya S. (34-26) in Hyogo on Friday. Nishinomiya S. managed to secure only three-point victory 84-81. However their fans expected easier game. Nishinomiya S. looked well-organized offensively handing out 22 assists. It was a great evening for swingman Naoki Tani (193-88) who led his team to a victory scoring 27 points and 5 rebounds. point guard Sotaro Uehara (170-94) helped adding 14 points, 8 rebounds and 7 assists. American power forward Denzel Bowles (208-89, college: JMU) responded with a double-double by scoring 33 points (!!!) and 12 rebounds. Nishinomiya S. have an impressive series of six victories in a row. They maintain third place with 34-26 record having eight points less than leader Shinshu BW. Kanazawa Sam. at the other side keeps the fifth position with 39 games lost. Important game to mention about took place in Matsuyama. Fourth ranked Bambitious Nara (22-38) saved a 3-point victory on the road edging 5th ranked Orange Vikings (20-40) 71-68 in the game for the fourth place. It was an exceptional evening for American power forward Gary Hamilton (208-84, college: Miami, FL, agency: Inception Sports) who led the winners and scored 4 points, 18 rebounds and 11 assists. Jeffrey Parmer accounted for 22 points and 8 rebounds. Bambitious Nara's coach Haruyuki Ishibashi allowed to play the deep bench players in such tough game. Forward Taishi Kasahara (188-89) came up with a double-double by scoring 16 points and 15 rebounds for Orange Vikings in the defeat. The victory was the fourth consecutive win for Bambitious Nara. They maintain fourth place with 22-38 record. Orange Vikings lost their fourth game in a row. They keep the fifth position with 40 games lost. Very important is a home loss of third ranked Cyberdyne IR (35-24) against fourth ranked Fukushima (26-33) on Saturday night. Host Cyberdyne IR was crushed by Fukushima in Tsukuba 92-72. The best player for the winners was Evan Ravenel who had a double-double by scoring 27 points and 12 rebounds. Kohei Fukuzawa produced 17 points for the hosts. Both coaches used bench players which allowed the starters a little rest for the next games. Fukushima maintains fourth place with 26-33 record. Loser Cyberdyne IR keeps the third position with 24 games lost. Fukushima will have a break next round, and it should allow them to practice more before next game. Cyberdyne IR will play again against Fukushima and it may be a tough game between close rivals. The game between Top Four teams took place in Hiroshima. 3rd placed host Dragonflies (32-28) lost to first ranked Kumamoto V. (45-15) 86-70. Chehales Tapscott orchestrated the victory with a double-double by scoring 18 points and 11 rebounds. Both coaches tested many bench players and allowed the starting five to rest. The victory was the twelfth consecutive win for Kumamoto V.. They maintain first place with 45-15 record. Dragonflies lost their fifth game in a row. Newly promoted team keep the third position with 28 games lost. The game between Top Four teams took place in Tokyo. 4th placed host Tokyo Z (21-38) lost to second ranked Toyotsu FE (41-18) 92-79. It was a great evening for Garrett Stutz who led his team to a victory with a double-double by scoring 23 points and 12 rebounds. Toyotsu FE's coach Ryuji Watanabe used entire bench saving starting five for next games. Toyotsu FE maintains second place with 41-18 record having just two points less than leader Shinshu BW. Loser Tokyo Z keeps the fourth position with 38 games lost. Toyotsu FE will have a break next round. Tokyo Z's supporters look forward to an exciting derby game next round, where their team will face at home their local rival from Tokyo Tokyo Z. There were no shocking results in the rest of the games of round 59: Bambitious Nara won against Ehime OV on the opponent's court 81-75. Sendai 89ers outscored Aomori Watts in a home game 77-56. Kanazawa Sam. recorded a loss to Nishinomiya S. on the road 61-54. Shinshu BW crushed Tokyo HT on its own court 88-61. Kumamoto V. beat Hiroshima D. in a road game 93-81. Yamagata lost to Gunma at home 75-85. Shimane SM outscored Kagawa FA on the opponent's court 81-56. The most impressive stats of the last round was 35 points (!!!) and 14 rebounds by Jamari Traylor of Hiroshima D.. The game between Top Four teams took place in Hiroshima. 3rd placed host Dragonflies (32-28) lost to first ranked Kumamoto V. (45-15) 86-70. Kumamoto V. outrebounded Dragonflies 44-32 including 31 on the defensive glass. Their players were unselfish on offense dishing 24 assists. American forward Chehales Tapscott (195-90, college: Portland St.) orchestrated the victory with a double-double by scoring 18 points and 11 rebounds. Point guard Takumi Furuno (179-93) contributed with 16 points and 8 assists for the winners. Four Kumamoto V. players scored in double figures. American forward Carl Landry (206-83, college: Purdue) answered with a double-double by scoring 20 points and 11 rebounds (on 9-of-11 shooting from the field) and the other American import power forward Jamari Traylor (203-92, college: Kansas) added 15 points, 12 rebounds, 4 assists and 4 steals in the effort for Dragonflies. Both coaches tested many bench players and allowed the starting five to rest. The victory was the twelfth consecutive win for Kumamoto V.. They maintain first place with 45-15 record. Dragonflies lost their fifth game in a row. Newly promoted team keep the third position with 28 games lost. Fifth-ranked Kanazawa Sam. (21-39) gave a tough game to third ranked Nishinomiya S. (34-26) in Hyogo on Friday. Nishinomiya S. managed to secure only three-point victory 84-81. However their fans expected easier game. Nishinomiya S. looked well-organized offensively handing out 22 assists. It was a great evening for swingman Naoki Tani (193-88) who led his team to a victory scoring 27 points and 5 rebounds. Point guard Sotaro Uehara (170-94) helped adding 14 points, 8 rebounds and 7 assists. Four Nishinomiya S. players scored in double figures. American power forward Denzel Bowles (208-89, college: JMU) responded with a double-double by scoring 33 points (!!!) and 12 rebounds and Jamaican-American power forward Ryan Reid (204-86, college: FSU) scored 15 points, 9 rebounds and 4 assists. Nishinomiya S. have an impressive series of six victories in a row. They maintain third place with 34-26 record having eight points less than leader Shinshu BW. Kanazawa Sam. at the other side keeps the fifth position with 39 games lost. The game between closely ranked teams ended with 5th ranked Orange Vikings' (20-40) home loss to fourth ranked Bambitious Nara (22-38) 75-81 on Friday. Bambitious Nara looked well-organized offensively handing out 24 assists. Americans were the main players on the court. It was a great evening for forward Jeffrey Parmer (203-85, college: FAU) who led his team to a victory with a double-double by scoring 32 points and 11 rebounds. Power forward Gary Hamilton (208-84, college: Miami, FL, agency: Inception Sports) helped adding 13 points, 14 rebounds and 10 assists. Power forward Andrew Fitzgerald (202-90, college: Oklahoma) responded with a double-double by scoring 27 points, 13 rebounds and 4 assists and swingman Lakeem Jackson (195-90, college: S.Carolina, agency: SDJ Sports) produced a double-double by scoring 19 points, 14 rebounds and 6 assists. Both coaches allowed to play bench players saving starting five for next games. The victory was the fourth consecutive win for Bambitious Nara. They maintain fourth place with 22-38 record. Orange Vikings lost their fourth game in a row. They keep the fifth position with 40 games lost. Rather predictable result when second ranked Sendai 89ers (39-20) smashed at home 6th ranked Aomori Watts (15-44) 77-56 on Saturday. Sendai 89ers dominated down low during the game scoring 50 of its points in the paint compared to Aomori Watts' 28. They looked well-organized offensively handing out 25 assists. It was a great evening for American forward Tyler Harris (208-93, college: Auburn) who led his team to a victory with a double-double by scoring 22 points, 13 rebounds and 6 assists. His fellow American import center Daniel Miller (211-91, college: Georgia Tech) helped adding 13 points, 12 rebounds and 4 blocks (on 6-of-7 shooting from the field). Four Sendai 89ers players scored in double figures. Lithuanian power forward Julius Jucikas (205-89, agency: Octagon Europe) responded with 25 points and 9 rebounds and South Sudanese forward Mogga Lado (201-95, college: Campbell) scored 6 points and 9 rebounds. The winner was already known earlier in the game, so both coaches allowed to play the bench players saving starting five for next games. Sendai 89ers maintains second place with 39-20 record having four points less than leader Shinshu BW. Loser Aomori Watts keep the sixth position with 44 games lost. Sendai 89ers will face again Aomori Watts (#6) at home in the next round. Not a big story in a game in Hyogo where 5th ranked Kanazawa Sam. (21-39) was defeated by third ranked Nishinomiya S. (34-26) 61-54 on Saturday. It was a great evening for point guard Sotaro Uehara (170-94) who led his team to a victory with a double-double by scoring 15 points, 11 rebounds and 7 assists. Swingman Naoki Tani (193-88) helped adding 17 points and 5 rebounds. Nishinomiya S.'s coach Miodrag Rajkovic used an eleven-player rotation saving starting five for next games. American power forward Denzel Bowles (208-89, college: JMU) responded with a double-double by scoring 21 points and 13 rebounds and Jamaican-American power forward Ryan Reid (204-86, college: FSU) scored 6 points and 12 rebounds. The victory was the sixth consecutive win for Nishinomiya S.. They maintain third place with 34-26 record having eight points less than leader Shinshu BW. Loser Kanazawa Sam. keeps the fifth position with 39 games lost. Important game to mention about took place in Matsuyama. Fourth ranked Bambitious Nara (22-38) saved a 3-point victory on the road edging 5th ranked Orange Vikings (20-40) 71-68 in the game for the fourth place. Bambitious Nara players were unselfish on offense dishing 21 assists. It was an exceptional evening for American power forward Gary Hamilton (208-84, college: Miami, FL, agency: Inception Sports) who led the winners and scored 4 points, 18 rebounds and 11 assists. His fellow American import forward Jeffrey Parmer (203-85, college: FAU) accounted for 22 points and 8 rebounds for the winning side. Bambitious Nara's coach Haruyuki Ishibashi allowed to play the deep bench players in such tough game. Forward Taishi Kasahara (188-89) came up with a double-double by scoring 16 points and 15 rebounds and American power forward Andrew Fitzgerald (202-90, college: Oklahoma) added 23 points and 7 rebounds respectively for Orange Vikings in the defeat. The victory was the fourth consecutive win for Bambitious Nara. They maintain fourth place with 22-38 record. Orange Vikings lost their fourth game in a row. They keep the fifth position with 40 games lost. Everything went according to plan in Nagano where first ranked Shinshu BW (47-12) outscored 6th ranked Tokyo HT (11-48) 88-61 on Saturday. Shinshu BW dominated down low during the game scoring 52 of its points in the paint compared to Tokyo HT's 30. They outrebounded Tokyo HT 52-32 including a 35-21 advantage in defensive rebounds. It was a great evening for American swingman Richard Roby (198-85) who led his team to a victory with a double-double by scoring 29 points and 13 rebounds. His fellow American import center Wayne Marshall (211-86, college: Temple) helped adding 20 points, 10 rebounds and 4 blocks (on 9-of-10 shooting from the field). Forward Takafumi Asano (192-85) responded with 14 points and 6 rebounds and guard Hiroya Ogane (180-89) scored 14 points and 5 rebounds. The winner was already known earlier in the game, so both coaches allowed to play the bench players saving starting five for next games. Shinshu BW maintains first place with 47-12 record. Tokyo HT lost their sixth game in a row. Newly promoted team keeps the sixth position with 48 games lost. Shinshu BW will face again Tokyo HT (#6) at home in the next round which should be theoretically another easy game. Very important is a home loss of third ranked Cyberdyne IR (35-24) against fourth ranked Fukushima (26-33) on Saturday night. Host Cyberdyne IR was crushed by Fukushima in Tsukuba 92-72. They made 20-of-26 free shots (76.9 percent) during the game. Fukushima looked well-organized offensively handing out 25 assists. The best player for the winners was American power forward Evan Ravenel (204-89, college: Ohio St.) who had a double-double by scoring 27 points and 12 rebounds. His fellow American import center Chris Brady (208-95, college: Monmouth) chipped in a double-double by scoring 10 points and 15 rebounds. Point guard Kohei Fukuzawa (177-93) produced 17 points and guard Atsunobu Hirao (178-89) added 12 points and 4 assists respectively for the hosts. Both coaches used bench players which allowed the starters a little rest for the next games. Fukushima maintains fourth place with 26-33 record. Loser Cyberdyne IR keeps the third position with 24 games lost. Fukushima will have a break next round, and it should allow them to practice more before next game. Cyberdyne IR will play again against Fukushima and it may be a tough game between close rivals. The game between Top Four teams took place in Tokyo. 4th placed host Tokyo Z (21-38) lost to second ranked Toyotsu FE (41-18) 92-79. They made 17-of-20 free shots (85.0 percent) during the game. Toyotsu FE outrebounded Tokyo Z 42-24 including a 30-19 advantage in defensive rebounds. They looked well-organized offensively handing out 28 assists. It was a great evening for American center Garrett Stutz (214-90, college: Wichita St.) who led his team to a victory with a double-double by scoring 23 points and 12 rebounds. His fellow American import forward Josh Hawkinson (208-95, college: WSU) helped adding 25 points, 5 rebounds and 5 assists. Toyotsu FE's coach Ryuji Watanabe used entire bench saving starting five for next games. American forward Jahmar Thorpe (198-84, college: Houston) responded with 22 points and 6 rebounds and swingman Keisuke Murakoshi (195-94) scored 17 points and 5 rebounds. Toyotsu FE maintains second place with 41-18 record having just two points less than leader Shinshu BW. Loser Tokyo Z keeps the fourth position with 38 games lost. Toyotsu FE will have a break next round. Tokyo Z's supporters look forward to an exciting derby game next round, where their team will face at home their local rival from Tokyo Tokyo Z. There was no surprise in Hiroshima where 3rd placed Dragonflies (32-28) were defeated by first ranked Kumamoto V. (45-15) 93-81 on Saturday. Kumamoto V. looked well-organized offensively handing out 25 assists. It was a great evening for Dutch-Australian power forward Josh Duinker (209-89, college: Richmond) who led his team to a victory with a double-double by scoring 26 points and 11 rebounds. American forward Chehales Tapscott (195-90, college: Portland St.) helped adding 23 points, 8 rebounds and 6 assists. Four Kumamoto V. players scored in double figures. American power forward Jamari Traylor (203-92, college: Kansas) responded with a double-double by scoring 35 points (!!!) and 14 rebounds and the former international forward Shogo Asayama (192-81) scored 16 points. Dragonflies' coach rotated eleven players in this game, but that didn't help. The victory was the twelfth consecutive win for Kumamoto V.. They maintain first place with 45-15 record. Dragonflies lost their fifth game in a row. Newly promoted team keep the third position with 28 games lost. No shocking result in a game when first ranked Gunma (43-16) won against on the road 5th ranked Yamagata (21-38) 85-75 on Saturday. It was a great evening for guard Fumiya Sato (170-90) who led his team to a victory scoring 27 points. American forward Thomas Kennedy (201-87, college: Detroit Mercy) helped adding 21 points and 6 rebounds. American center Will Creekmore (205-89, college: Missouri St.) responded with a double-double by scoring 22 points, 11 rebounds and 4 assists and Nigerian forward Chukwudiebere Maduabum (206-91) scored 18 points and 5 blocks (on 7-of-8 shooting from the field). Both coaches allowed to play bench players saving starting five for next games. Gunma maintains first place with 43-16 record, which they share with Shimane SM. Loser Yamagata dropped to the fourth position with 38 games lost. Gunma will have a break next round. Yamagata will play again at home against the league's leader Gunma (#1) and hope to win that game. Very expected game in Takamatsu where 6th ranked Kagawa FA (18-41) was crushed by second ranked Shimane Magic (43-16) 81-56 on Saturday. Shimane Magic looked well-organized offensively handing out 25 assists. It was a great evening for Hungarian-American Rosco Allen (208-93, college: Stanford, agency: Pensack Sports) who led his team to a victory with a double-double by scoring 29 points, 14 rebounds and 7 assists. Venezuelan center Gregory Echenique (206-90, college: Creighton, agency: Pensack Sports) helped adding 13 points and 9 rebounds. American center Eric Thompson (204-93, college: Pacific) responded with a double-double by scoring 11 points and 15 rebounds and the other American import guard Terrance Woodbury (201-87, college: Georgia) scored 17 points and 7 rebounds. The winner was already known earlier in the game, so both coaches allowed to play the bench players saving starting five for next games. The victory was the third consecutive win for Shimane Magic. They keep a position of league leader, which they share with Gunma. Kagawa FA lost their third game in a row. They keep the sixth place with 41 games lost. Shimane Magic will have a break next round. Kagawa FA will play again at home against the league's second-placed Shimane Magic (#2) and hope to win that game. There are only two more rounds left in the Second Stage in B League D3. Here is the last round review presented by ESL. The game between second ranked Iwate Big Bulls (4-4) and fourth ranked Tokyo Cinq R. (5-5) was the most important one in the last round on Saturday night. Iwate Big Bulls were defeated by Tokyo Cinq R. in a tough game in Tokyo 71-80. Tokyo Cinq R. outrebounded Iwate Big Bulls 38-26 including 26 on the defensive glass. American forward Chris Olivier (203-92, college: Oklahoma St.) orchestrated the victory by scoring 22 points and 7 rebounds. point guard Atomu Yamada (179-98) contributed with 14 points and 6 assists for the winners. American center Marcus Cousin (211-86, college: Houston) answered with 19 points and 9 rebounds for Iwate Big Bulls. Both coaches used bench players which allowed the starters a little rest for the next games. Tokyo Cinq R. moved-up to third place. Iwate Big Bulls at the other side dropped to the fourth position with four games lost. Tokyo Cinq R. are looking forward to face Gifu Swoops (#6) on the road in the next round. Iwate Big Bulls will play against the league's leader Tokyo Excel. and are hoping to win this game. An interesting game for Iwate Big Bulls (4-4) which played road game in Tokyo against 4th placed Tokyo Cinq R. (5-5). Second ranked Iwate Big Bulls managed to get a 6-point victory 79-73. American center Marcus Cousin (211-86, college: Houston) stepped up with a double-double by scoring 26 points and 10 rebounds for the winners and Titus Robinson chipped in 16 points and 9 rebounds. Iwate Big Bulls' coach Yuma Yoshida allowed to play the deep bench players saving starting five for next games. American forward Chris Olivier (203-92, college: Oklahoma St.) responded with a double-double by scoring 23 points and 15 rebounds. Despite that victory Iwate Big Bulls went down to fourth position due to points difference. Tokyo Cinq R. at the other side dropped to the third place with five games lost. Iwate Big Bulls will play against league's leader Tokyo Excel. at home in the next round and it will be quite challenging to get another victory. Tokyo Cinq R. will play against Gifu Swoops and hopes to get back on the winning track. B League D3 top team - Tokyo Excel. (8-0) had no problems winning another game on Friday. This time they crushed fifth ranked Saitama Broncos (3-5) 101-63. American players dominated the game. Ryan Stephan nailed a double-double by scoring 22 points, 16 rebounds and 6 assists for the winning side. Joshua Crawford came up with a double-double by scoring 24 points and 11 rebounds for Saitama Broncos in the defeat. The winner was already known earlier in the game, so both coaches allowed to play the bench players saving starting five for next games. Undefeated Tokyo Excel. have an impressive series of seven victories in a row. They maintain first place with 8-0 record. Loser Saitama Broncos keep the fifth position with five games lost. They share it with Gifu Swoops. Tokyo Excel. will meet Iwate Big Bulls (#4) on the road in the next round. Saitama Broncos will play against Kagoshima and it may be a tough game between close rivals. B League D3 top team - Tokyo Excel. (8-0) managed to deliver another win. This time they beat fifth ranked Saitama Broncos (3-5) 100-85. The best player for the winners was Ryan Stephan who scored 32 points, 7 rebounds and 4 assists (was perfect 7-for-7 from the free throw line). Tokyo Excel. 's coach used a ten-player rotation and allowed the starting five to rest. The victory was the seventh consecutive win for Tokyo Excel.. They maintain first place with 8-0 record. Saitama Broncos at the other side keep the fifth position with five games lost. Tokyo Excel. 's next round opponent will be Iwate Big Bulls (#4) on the road. Saitama Broncos will play against Kagoshima and it may be a tough game between close rivals. The game in Renova supposed to be also quite interesting. Third ranked Koshigaya A. (6-4) played at the court of 7th ranked Kagoshima (1-7). Koshigaya A. smashed Kagoshima 100-79 on Saturday. Kyle Richardson orchestrated the victory with a double-double by scoring 37 points (!!!) and 10 rebounds (on 16-of-21 shooting from the field). Since the result was very predictable, it gave the chance for the coaches to test many bench players and allowed the starting five to get some rest. Koshigaya A. moved-up to second place. Kagoshima lost their sixth game in a row. They stay at the bottom position with seven games lost. Koshigaya A. will have a break next round. Kagoshima will play on the road against Saitama Broncos (#5) and it may be a tough game between close rivals. In the last game of round 5 Koshigaya A. beat Kagoshima on the road 89-80. B League D3 top team - Tokyo Excel. (8-0) had no problems winning another game on Friday. This time they crushed fifth ranked Saitama Broncos (3-5) 101-63. Tokyo Excel. dominated down low during the game scoring 68 of its points in the paint compared to Saitama Broncos' 44 and made 21-of-24 free shots (87.5 percent) during the game. Tokyo Excel. forced 19 Saitama Broncos turnovers. They looked well-organized offensively handing out 31 assists comparing to just 16 passes made by Saitama Broncos' players. American players dominated the game. Center Ryan Stephan (208-94, college: Colorado Mesa) nailed a double-double by scoring 22 points, 16 rebounds and 6 assists for the winning side and forward Jordan Faison (201-94, college: Cal Poly Pomona) accounted for 27 points, 10 rebounds and 7 assists. Four Tokyo Excel. players scored in double figures. Center Joshua Crawford (211-88, college: Indiana St.) came up with a double-double by scoring 24 points and 11 rebounds and center Antone Warren (208-93, college: Antelope Valley CC) added 14 points and 9 rebounds respectively for Saitama Broncos in the defeat. The winner was already known earlier in the game, so both coaches allowed to play the bench players saving starting five for next games. Tokyo Excel. have an impressive series of seven victories in a row. They maintain first place with 8-0 record. Loser Saitama Broncos keep the fifth position with five games lost. They share it with Gifu Swoops. Tokyo Excel. will meet Iwate Big Bulls (#4) on the road in the next round. Saitama Broncos will play against Kagoshima and it may be a tough game between close rivals. The game between second ranked Iwate Big Bulls (4-4) and fourth ranked Tokyo Cinq R. (5-5) was the most important one in the last round on Saturday night. Iwate Big Bulls were defeated by Tokyo Cinq R. in a tough game in Tokyo 71-80. Tokyo Cinq R. outrebounded Iwate Big Bulls 38-26 including 26 on the defensive glass. American forward Chris Olivier (203-92, college: Oklahoma St.) orchestrated the victory by scoring 22 points and 7 rebounds. Point guard Atomu Yamada (179-98) contributed with 14 points and 6 assists for the winners. Five Tokyo Cinq R. players scored in double figures. American center Marcus Cousin (211-86, college: Houston) answered with 19 points and 9 rebounds and the other American import Titus Robinson (201-90, college: Buffalo) added 18 points in the effort for Iwate Big Bulls. Both coaches used bench players which allowed the starters a little rest for the next games. Tokyo Cinq R. moved-up to third place. Iwate Big Bulls at the other side dropped to the fourth position with four games lost. Tokyo Cinq R. are looking forward to face Gifu Swoops (#6) on the road in the next round. Iwate Big Bulls will play against the league's leader Tokyo Excel. and are hoping to win this game. B League D3 top team - Tokyo Excel. (8-0) managed to deliver another win. This time they beat fifth ranked Saitama Broncos (3-5) 100-85. Tokyo Excel. made 18-of-21 charity shots (85.7 percent) during the game. They also forced 20 Saitama Broncos turnovers. Their players were unselfish on offense dishing 25 assists. The best player for the winners was American center Ryan Stephan (208-94, college: Colorado Mesa) who scored 32 points, 7 rebounds and 4 assists (was perfect 7-for-7 from the free throw line). His fellow American import forward Jordan Faison (201-94, college: Cal Poly Pomona) chipped in 27 points, 9 rebounds and 5 assists. Four Tokyo Excel. players scored in double figures. Tokyo Excel. 's coach used a ten-player rotation and allowed the starting five to rest. American center Joshua Crawford (211-88, college: Indiana St.) produced 23 points and 5 rebounds and Masaya Ueda (177-93) added 13 points and 8 assists respectively for the guests. The victory was the seventh consecutive win for Tokyo Excel.. They maintain first place with 8-0 record. Saitama Broncos at the other side keep the fifth position with five games lost. Tokyo Excel. 's next round opponent will be Iwate Big Bulls (#4) on the road. Saitama Broncos will play against Kagoshima and it may be a tough game between close rivals. The game in Renova supposed to be also quite interesting. Third ranked Koshigaya A. (6-4) played at the court of 7th ranked Kagoshima (1-7). Koshigaya A. smashed Kagoshima 100-79 on Saturday. Koshigaya A. dominated down low during the game scoring 74 of its points in the paint compared to Kagoshima's 34. They outrebounded Kagoshima 42-31 including 27 on the defensive glass. Koshigaya A. looked well-organized offensively handing out 25 assists. American Kyle Richardson (201-91, college: Portland St.) orchestrated the victory with a double-double by scoring 37 points (!!!) and 10 rebounds (on 16-of-21 shooting from the field). His fellow American import Luke Evans (203-91, college: CBU) contributed with a double-double by scoring 17 points, 12 rebounds and 4 assists for the winners. Bahamas center Gjio Bain (211-85, college: S.Mississippi) answered with 18 points and 9 rebounds and American forward Shelton Boykin (198-92, college: Angelo St.) added 16 points and 7 rebounds in the effort for Kagoshima. Four Kagoshima players scored in double figures. Since the result was very predictable, it gave the chance for the coaches to test many bench players and allowed the starting five to get some rest. Koshigaya A. moved-up to second place. Kagoshima lost their sixth game in a row. They stay at the bottom position with seven games lost. Koshigaya A. will have a break next round. Kagoshima will play on the road against Saitama Broncos (#5) and it may be a tough game between close rivals. An interesting game for Iwate Big Bulls (4-4) which played road game in Tokyo against 4th placed Tokyo Cinq R. (5-5). Second ranked Iwate Big Bulls managed to get a 6-point victory 79-73. American center Marcus Cousin (211-86, college: Houston) stepped up with a double-double by scoring 26 points and 10 rebounds for the winners and his fellow American import Titus Robinson (201-90, college: Buffalo) chipped in 16 points and 9 rebounds. Iwate Big Bulls' coach Yuma Yoshida allowed to play the deep bench players saving starting five for next games. American forward Chris Olivier (203-92, college: Oklahoma St.) responded with a double-double by scoring 23 points and 15 rebounds and Kodai Takahashi (180-91) scored 14 points. Despite that victory Iwate Big Bulls went down to fourth position due to points difference. Tokyo Cinq R. at the other side dropped to the third place with five games lost. Iwate Big Bulls will play against league's leader Tokyo Excel. at home in the next round and it will be quite challenging to get another victory. Tokyo Cinq R. will play against Gifu Swoops and hopes to get back on the winning track. No shocking result in a game when third ranked Koshigaya A. (6-4) beat bottom-ranked Kagoshima (1-7) in Renova 89-80 on Sunday. It was a great shooting night for Koshigaya A. especially from behind the arc, where they had solid 52.6 percentage. American Kyle Richardson (201-91, college: Portland St.) orchestrated the victory with a double-double by scoring 30 points and 16 rebounds. Hotaru Yokotsuka (179-90) contributed with 19 points for the winners. American forward Shelton Boykin (198-92, college: Angelo St.) answered with a double-double by scoring 28 points, 12 rebounds and 6 assists and Kiichi Kawakami (188-95) added 16 points in the effort for Kagoshima. Both teams had four players each who scored in double figures. Koshigaya A. moved-up to second place. Kagoshima lost their sixth game in a row. They stay at the bottom position with seven games lost. Koshigaya A. will have a break next round. Kagoshima will play on the road against Saitama Broncos (#5) and it may be a tough game between close rivals.